Very friendly and helpful staff. Nice little India location. Half hour Walker to centre and 12 mins by Mtr. Very recommendable place. The advices from the staff helps a lot, good location for budget. The breakfast is basic but enough. Coffee and tea all day! 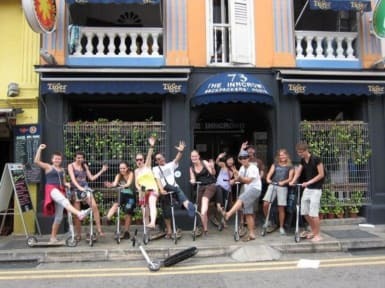 Take the scooter tour, is so funny. Super well located!!!! Personal is super nice and the bed are nice comfortable and clean!!! And the price is amazing!!!! I had amazing days over there! Esta bien ubicado, su personal fue amable, me ayudaron con mis requerimientos e inquietudes. Adicional te ofrecen desayuno. El hostal ha sido lo que esperábamos, queda en un lugar estratégico cerca del MRT que hace posible descubrir Singapur fácilmente. Las camas no son muy cómodas, los colchones se sienten los resortes, sin embargo cumple con lo que ofrece. Bien situado, buena relación calidad precio, las taquillas son pequeñas pero sobre todo: necesitan más enchufes en las habitaciones! Estamos en 2018. Had a short 2 days stay at this hostel. The people at the reception are really friendly and helpful, the breakfast is alright and the location is good. However, those are the only good things about this hostel. There are many guests who are working in Singapore and do not socialize. Some of them are really smelly and that made the room horrible, along with the terrible mattress. There are guests that wash their FEET in the SINK at the same time you’re brushing your teeth. Never going back there.